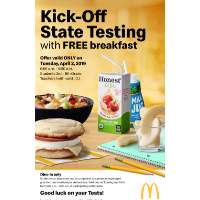 FORT SMITH, AR (April 2, 2019) – State testing is fast approaching, and McDonald’s is making sure students start their day on a full stomach by offering free breakfast on Tuesday, April 2, in Fort Smith, Arkansas and surrounding areas. Students and even teachers will be able to stop by a participating McDonald’s and pick up a balanced meal to prepare for the big day. The morning of April 2, students in third through eighth grade, as well as teachers, can visit their local participating McDonald’s from 6:00 to 9:00 a.m. to enjoy their choice of an Egg White Delight McMuffin Sandwich or Fruit and Maple Oatmeal, apple slices, and choice of 1% low fat milk or an Honest Kids Apple Juice Box. Numerous studies have shown that students who eat breakfast on the morning of a standardized test score significantly higher than those who do not have breakfast. “It’s our pleasure to offer a wholesome meal to Arkansas students to help them prepare for their state testing,” said Michael Hadley, Arkansas McDonald’s Owner/Operator. “We want our students in Arkansas to be as successful as possible and that is tough to do without a healthy breakfast.” The free breakfast for students and teachers is a demonstration of the McDonald’s Owner/Operators’ commitment to their local communities. In order to take advantage of the offer, students should visit a participating McDonald’s with a parent or guardian, and teachers should have a valid teacher/school identification card handy. McDonald’s USA LLC, serves a variety of menu options made with quality ingredients to more than 27 million customers every day. Nearly 90 percent of McDonald’s 14,000 U.S. restaurants are independently owned and operated by businessmen and women. 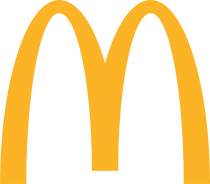 Customers can now log online for free at approximately 11,500 participating Wi‐Fi enabled McDonald’s U.S. restaurants. For more information, please visit www.mcdonalds.com, or follow us on Twitter @McDonalds and Facebook www.facebook.com/mcdonalds.